Why Should I Store My Awning in Winter? Clear off any leaves or dirt that have settled on top of your awning. Spray the awning with a hose to get rid of stubborn dirt. If simply hosing it off isn’t working, grab a hard-bristled brush and attempt to scrub away the stains and dirt spots. Gather some soapy water in a bucket and use it to scrub the awning clean. Rinse with the hose. Before rolling the awning up, it’s important to make sure it has completely dried. If moisture remains, the awning could develop mold or mildew while in storage. Retract the awning, or remove the awning once dry. Fold the awning up and be sure to tuck away loose ends or fabric to avoid possible tearing. If you have a winter cover for your retractable awning, use it! If you don’t have a retractable awning, be sure to store your awning in a dry place to avoid mold or mildew growth. Keep in mind that it’s always important to take a look at the care instructions for your awning before doing anything. Your awning might have specific cleaning guidelines, which will be important to follow to prevent damage. If you would rather avoid doing this yourself, a professional can help! Carroll Awning Company offers a winter storage service for your awnings. We will come to your home, take down your awning, store it in a safe place during the winter, and re-install it in the spring. 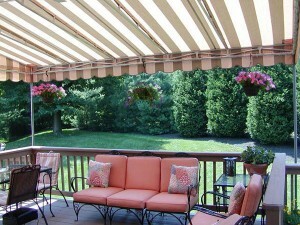 If you’ve never dealt with an awning before, a professional’s help might be the better option. That way, you can ensure your awning will be in tip-top shape for the arrival of spring! For more information on Carroll Awning Company’s winter storage service, or for a FREE on-site estimate, call us at 1-800-999-5617 or click here today!